Throughout much of 2018, home prices were high, demand was rising and bidding wars were the new normal. As a result of the competitive market, buyers were under more pressure to seek qualification for larger loans. Fraud can come in many forms, but income falsification remains one of the most likely misrepresentations. By December 2018, income-specific loan risk had increased 12 percent compared with one year ago. However, income risk has remained flat in 2019, begging the question, what drives income misrepresentation? In January of 2013, the Consumer Finance Protection Bureau published new requirements for mortgage lenders to carefully assess a consumer’s ability to repay their mortgage loan, dubbed “ability-to-repay” rules. The rules were intended to discourage the use of high debt-to-income loans that were common during the housing boom. Additionally, the rules required lenders to strengthen the mortgage loan manufacturing and underwriting practices associated with the determination of a consumer’s ability to repay. 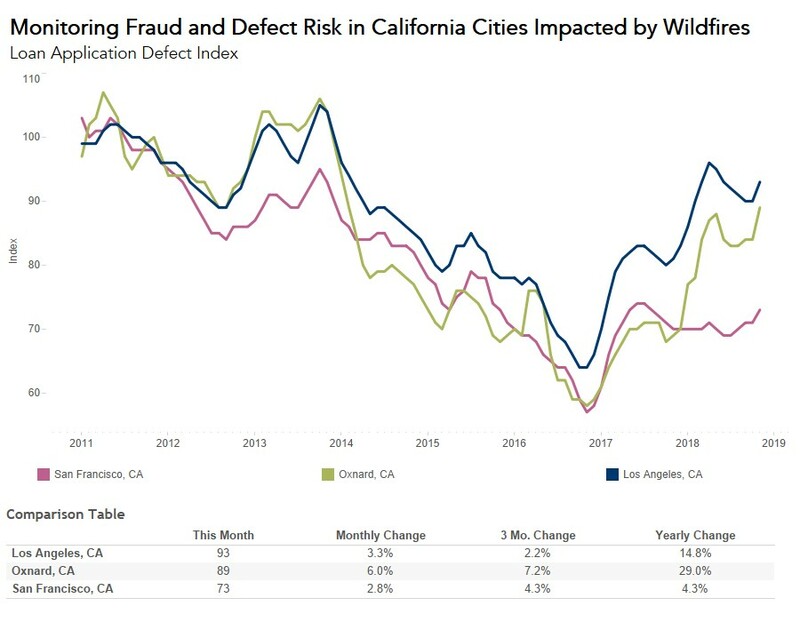 Income-specific defect and fraud risk had been on the rise since March 2018, however, as of this February, income-specific defect and fraud risk remains 57 percent lower than its peak in November 2012. The shift in the mix of loan applications toward more purchase applications and pressure on borrowers likely fed the 2018 increase in income-specific defects. Between January 2018 and December 2018, interest rates increased 0.61 percentage points, while house prices continued to grow. 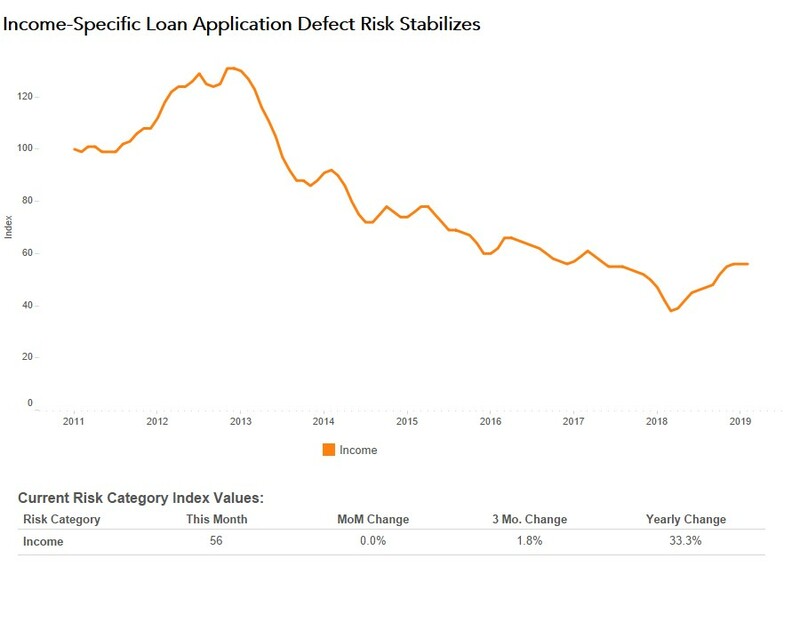 Because of higher interest rates, refinancing activity slowed and the share of purchase loan applications compared with refinance loan applications increased. Purchase loan applications typically are more likely to have fraud than refinance transactions. Furthermore, in the strong seller’s market we experienced in 2018, borrowers had more motivation to misrepresent income on a loan application in order to qualify for the bigger mortgage necessary to win the bidding war for a home. 2018 ended the year with a decline in the 30-year, fixed-rate mortgage in December, a trend that has persisted through the first quarter of the year. Additionally, nominal house price appreciation in January sank to the slowest pace of growth since February 2015, according to the DataTree by First American House Price Index. As affordability improves and demand increases going into the spring home-buying season, we expect the seller’s market conditions to return, potentially elevating income misrepresentation risk as well. The Defect Index is updated monthly with new data. 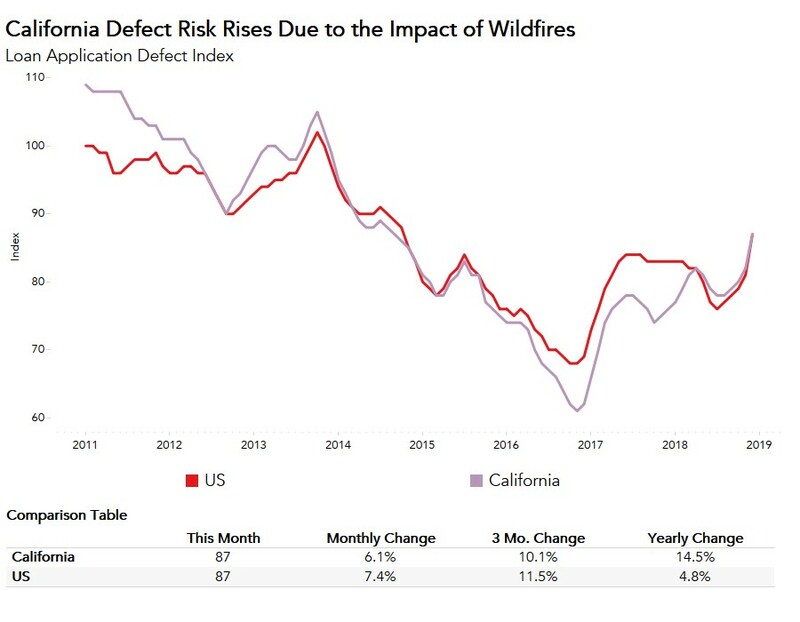 Look for the next edition of the Defect Index the week of April 29, 2019. Deputy Chief Economist Odeta Kushi contributed to this post. What Can Hurricane Irma Teach Us About Defect Risk Trends Following Hurricanes Florence and Michael? 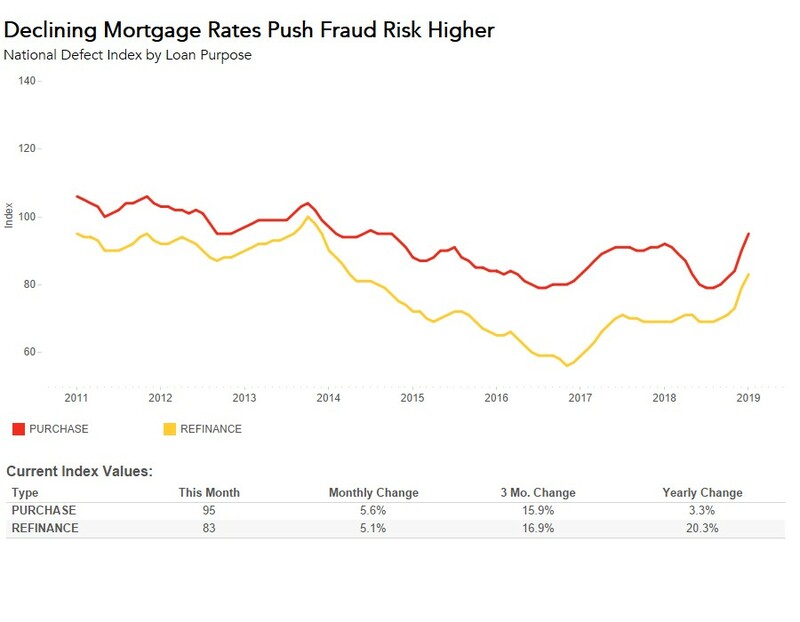 Why Is Loan Application Fraud Risk Accelerating?